Thomas Zeitzoff is a PhD candidate at New York University. I came across his research thanks to the Ushahidi network, and am really glad I did. He wrote a really neat paper earlier this year on “The Micro-dynamics of Reciprocity in an Asymmetric Conflict: Hamas, Israel, and the 2008-2009 Gaza Conflict,” which he is revising and submitting to peer-review. Updated: Thomas kindly sent me the most recent version of his paper which you can download here (PDF). I’ve done some work on conflict event-data and reciprocity analysis (see this study of Afghanistan), but Thomas is really breaking new ground here with the hourly temporal resolution of the conflict analysis, which was made possible by Al-Jazeera’s War on Gaza project powered by Ushahidi. nd that Israel responds about twice as intensely to a Hamas escalation as Hamas responds to an Israeli escalation. Furthermore, I find that both Hamas’ and Israel’s response patterns change once the ground invasion begins and after the UN Security Council votes. rm my hypotheses that Israel’s reactions were more dependent upon Hamas and that these responses were contextually dependent. Perhaps the main question I would have for Thomas is how he thinks his analysis and findings could be used for conflict early warning and rapid response to violent conflict. 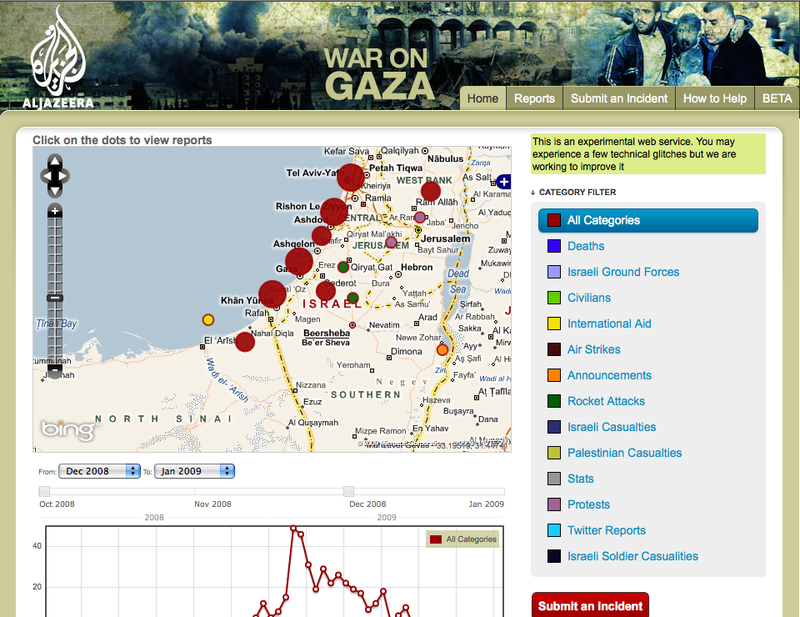 This entry was posted in Lessons and tagged Al-Jazeera, Analysis, conflict, Gaza, Israel, micro, ushahidi. Bookmark the permalink.